ABOVE: The MUC control tower, viewed from München Airport Center. If you're flying to Germany, there's a good chance that you're headed for Bavaria. 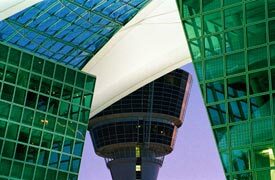 And if that's the case, it makes sense to fly directly to Europe's eighth-largest airport: Munich International Airport, which lies in the heart of Germany's most popular tourist region. Nearly 25 million people travel through Munich's airport every year, flying on some 90 major airlines and low-cost carriers that offer connections to 207 destinations in 60 countries. Two parallel runways and a minimum connection time of only 35 minutes let passengers get in and out of the airport in a hurry--whether they're in transit, visiting Munich, or headed for the nearby Alps. Munich International Airport also trumps its rivals in another area: services for passengers who have early departures or time to kill between flights. With a hotel, a shopping center, and a visitor park on the airport grounds, MUC provides more indoor and outdoor diversions than most airports do.